April and May were busier than usual for me this year. In my “other life” (as I sometimes call my time away from Barkerville) I am a program developer, writer, director and consultant for heritage sites and museums. This spring was particularly active professionally, and as such I’ve been traveling a lot. In April I made my way to Steveston to work with the Gulf of Georgia Cannery. What an amazing National Historic Site. To be honest I’d never been there before, and now I’m telling everyone to go. Their museology is innovative and evocative, and the stories of the many immigrants who began their lives in British Columbia in the fishing and canning industry are so moving. I went to Vancouver Island in May for a customary two week stint working with the Parliamentary Players, a truly fine historical theatre program at BC’s Legislative Assembly. My husband and I have been involved with the Players as writers and directors for more than a decade now, and I love this annual gig. Working with fresh, talented young actors, in what is surely one of the most gorgeous historical settings for a provincial capital, is kind of a dream come true. My time in Victoria coincided with the opening of the Royal BC Museum’s newest exhibition, Gold Rush: El Dorado in British Columbia. So of course I went there on the first day. The exhibit is very, very good. I knew I would love it (everything I’ve ever seen at the RBCM has been first rate) and I knew the subject matter would be of keen interest to me considering my experience interpreting gold rush history. What I was unprepared for was how emotionally impacted I would be as I walked through this state-of-the-art, world class museum experience. Every aspect of the exhibit has been handled with boldness and clarity. The story of gold, how it mobilized the world, how it has been such a powerful spiritual and economic force for so long, is fascinating. The exhibit portrays the world’s various gold rushes, and in particular our own BC rushes, with care and detail that had me welling up with tears. There is respectful attention paid to the lasting negative implications of the golden frenzy that created our province, including environmental devastation and the brutal realities of colonialism. These truths are beautifully balanced with the resonating, human stories of those people who risked everything for the mere chance of striking it rich. And, happily, Barkerville is well represented within this comprehensive exhibit. Every experience I have working with or attending other museums fuels my work in Barkerville. The stories told at other sites remind me that world history is a tapestry of human lives that intertwine to tell the biggest story of all: the story of us. The work we do at the Parliament Buildings connects to Barkerville through characters and subjects, and I’m already finding myself referencing themes from the Gulf of Georgia Cannery and Gold Rush: El Dorado in British Columbia in my early season work at my home historic site. Stories intersect and overlap; every story meets every other story. My job as a museum interpreter is, in large part, to be open to understanding, appreciating and communicating these connections. Working with and attending other museums is the best way I’ve found to fill up my tank with material and inspiration for each new and exciting season in Barkerville. 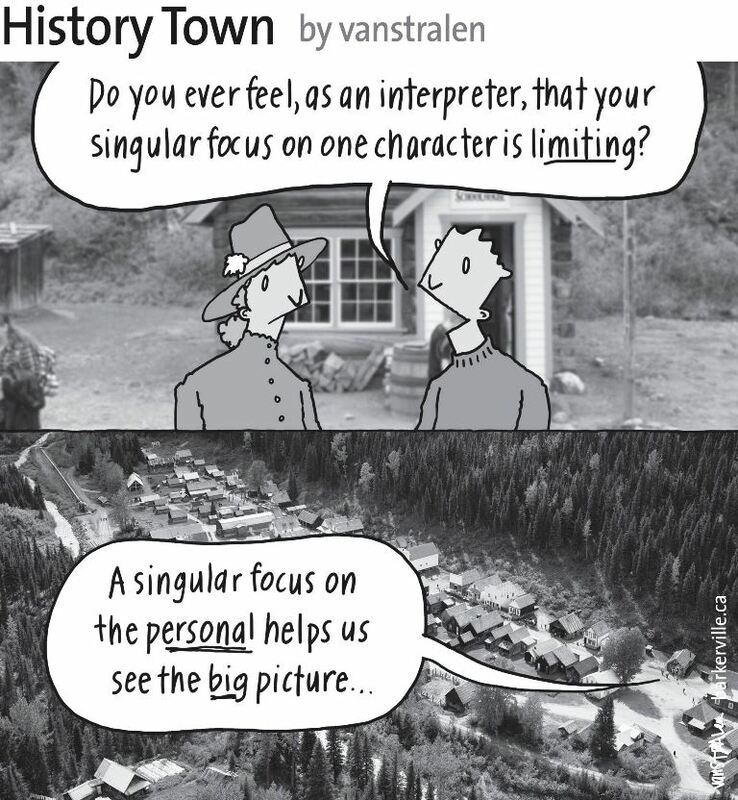 The above one-panel cartoon (originally published June 6, 2015) by Dirk Van Stralen, with accompanying editorial by Danette Boucher, is the first of twenty weekly entries that were logged – and subsequently blogged – as part of a 2015 collaboration between Barkerville, British Columbia and the Prince George Citizen aimed at introducing some of the quirkier advantages to living, working, and playing in the Cariboo Goldfields. We hope you enjoy!